The ADA Fishing Pier will be closed for concrete work for approximately one week beginning on 10-22-18. Upon completion of this work rehab work will begin on the deck and rails. While this work is being done the ADA Fishing Pier will be closed from 7:15 am to 2:25 pm. The pier will be open to the public after those times when the Park is open. 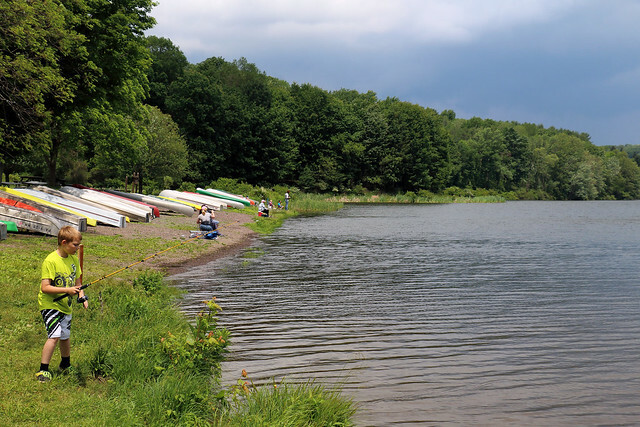 Frances Slocum State Park consists of 1,035 acres in northeastern Pennsylvania’s Luzerne County. The park is five miles from Dallas and ten miles from Wilkes-Barre. From Exit 170B of I-81, take PA 309 north 7.2 miles. Turn right (east) onto Carverton Road and drive for 4.2 miles. Turn left (north) on West 8th Street and drive 1.3 miles. Turn left (west) onto Mt. Olivet Road and drive one mile to the park entrance on the left. Natural, cultural, historical, and recreational programs are conducted by a park environmental educator from March through November. From Memorial Day weekend through Labor Day, many programs are offered at the campground amphitheater. Curriculum-based environmental education programs and teacher workshops are available to area schools. The environmental education center sits near Frances Slocum Lake in the day use area. The building features exhibits on American Indians and the ecology of the park. Programs are offered from March to November. The center is named for Patrick Solano, who served as deputy secretary for Parks and Forests with the former Department of Environmental Resources and as the acting secretary when the Department of Conservation and Natural Resources was created in 1995. Mr. Solano has held many prestigious positions, including senior counselor to two governors and a senate majority leader. During World War II, Mr. Solano completed 23 combat missions with the Eighth U.S. Air Force Heavy Bombardment Group. For his service, he was awarded the Group Presidential Citation, the Air Force Medal with two Oak Leaf Clusters, and the European Combat Theatre Medal with two Bronze Stars.